Kids Bedtime Reading About Cooking: In Combating Eating Disorders, Can Food Be Its Own Best Defense? "Listen to the stories your food can tell you," my Italian granddad always says. So commences the bedtime story In the Kitchen with Grandad. Running to 26 pages and focusing on Italian cuisine, it is the first paperback in a series of vignettes on international cooking, of which each is to treat of a different country. Making nutritional recommendations to our kids can carry some weighty responsibility, especially in view of current disturbing indices of childhood obesity, including any potential development of other connected or variously-related eating disorders. When considering what is occasionally portrayed, quite inaccurately, as the 'typical' Italian matriarch shoveling colossal portions of pasta into her grandchildren's mouths, I am nonetheless pressed to acknowledge that the archetype, albeit exaggerated, can sometimes betray a grain of truth. It lies in the fact that our grandmother here probably still remembers what true scarcity really is. Having possibly been a child during the war years when there could literally be nothing to eat, hers is doubtless an appetite powered by the realization that it is not always a given that the plentiful surpluses of today will necessarily stock tomorrow's grocery shelves. Such concern could easily prompt an overconsumption which militates against any chance in the near or distant future -whether great or small- that a day may come again when there shall once more be little to set upon the table. Certainly Italians are known for their indulgent fondness for fine cuisine. Partly this is owing to the fact that dining remains closely associated with the family table and with that gregarious sense of community we often find so endearing. It also signals the attention they tend to invest in their gastronomic creations as well as in that good-humored insistence upon culinary finesse as something deserving of only the most ambitious aspirations toward excellence. Such soaring demands call to mind early artisan connections with food, most of which no longer survive. I am reminded here of my wife's great grandfather, who would go about the towns surrounding Bologna at the beginning of last century just as the pig that each family had been fattening over the summer was due for slaughter. A highly sought-after service, his job was to quarter the animal, then cure all into seasoned cold cuts. Whatever he carved or minced, then salted and hung, would constitute the family's prized supply of salami, ham and lard for the approaching winter. Preserved with the year's wine in a cool cellar beneath the house, an essential source of pork would thus be procured and so too nothing was ever wasted. 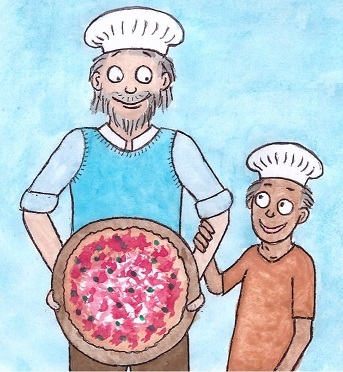 Besides stimulating a notion of competent males at the family stove, In the Kitchen with Grandad is a tribute to a gastronomic trajectory spanning centuries which seeks also to valorize the vital relationship between children and their grandparents. It highlights how our coveted older folk are often invaluable receptacles of knowledge and expertise concerning so many rich and variegated culinary traditions. Moreover, the story invites kids to reflect how, whereas today relatively recent channels of efficient food distribution make an ample selection of delicacies available to us, many town and village communities in former times were mostly dependent upon subsistence farming and usually ate only what the surrounding land produced. Centered around a household kitchen in Italy, the book relates how territorially-based consumption has left us with a geography of gastronomy which continues to demonstrate countless ways in which localized cultures of the past and even their 'small world' politics still frequently influence our dietary options. Furthermore, we remember that all that may be perfunctorily lumped together in supermarkets under the glib denomination 'Italian Cuisine' is often no less than a cluttered agglomerate of various narrations hailing from diverse local realities, each of which articulates the biography of a culinary context which was, and often remains, very regional indeed. And as Italy was only unified in 1871 it follows that, despite any evident cross-fertilization among communities, the many different dishes which remain to us derive from what were once 'many different Italies'. Useful to underscore at this stage is that the suggestion here is not one of imparting to children a concept of the importance of mindful nutrition as an invitation to uncontrolled consumption. Similarly, representing the generous selection on offer in our mega food stores as the preferred springboard towards proposing an enlightened approach to food for kids is probably as harmful to them as is purveying the belief that attentive eating somehow remains the exclusive province of the 'sophisticated' or, perish the thought, of the wealthy alone. Were we to return to the earliest beginnings, nothing could be further from the truth. On the contrary, quite the opposite was the case if we remain with Italy for our example, considering that many of the country's prized dishes were born not out of seasons of abundance but originated instead from periods of great scarcity. As such, a 'culturally curious appetite' is in fact anything but the privilege of those who 'can afford' to be impervious to social issues associated with poverty or who enjoy the luxury of deliberation in their gastronomic choices. Paradoxically therefore, what mostly initiated many of the Italian culinary creations we celebrate the world over today was really a motivation to bring out the best in what was often very modest variety within an economy of delicate flavors - and all from families which had relatively little to feed themselves. Thus are we also gently alerted in our food preparation to that subtle invitation to solidarity with those who have less, often hidden in so many aspects of what we regularly consume most eagerly, though not always as wittingly. In sum, accepting as we do that obesity can have various causes, some assuredly behavioral and not all of which are associated with how one has been socialized into eating, it would be frankly reductive to link it all to mere nutritional ignorance alone. However, assuming that informed eating can hardly contribute towards exacerbating obesity, we may as reasonably guess it might instead serve some greater good. Facilitating then the development of a healthy relationship to food in our kids thus becomes imperative. In the Kitchen with Grandad resets the focus upon some of the merits of the much-lauded Mediterranean diet whilst underscoring its contribution to balanced eating as well as to an eager daily involvement of our kids in those most exciting home-cooking creations. The book can be purchased here through Amazon.